Ever since I began writing a book, my dream was to sell it at the National Press Club book fair. And as my publication date drew closer I even checked with the Press Club to make sure that my book would be published by the submission deadline. Getting to the fair required a lot of procedural and other hurdles that impaired both my digestion and my sleep. But finally, a few weeks ago, I received the official acceptance. I then obsessed about my appearance for the great event. I bought a vintage red choker, a new top, and earrings from a boutique in Alexandria. One other mini-disaster threatened. Two hours before the fair, I got a call from the organizers informing me that my books had not yet arrived. My husband offered to deliver books we had already purchased and dashed off to our home in Alexandria to get them. Ten minutes later, I got a second call with the good news that the books showed up in the fair’s very last shipment. All the strategizing, anxiety and planning was worth it. The fair is a terrific event, drawing many big-name authors and hundreds of visitors. Those authors lucky enough to be selected celebrate their good fortune at a private reception before the event begins. I wouldn’t stand in line to get a glimpse of a movie star, or snag an autograph from my favorite musician, but I was dazzled to be in the same room as accomplished writers such as Hedrick Smith and David Corn. I also was pretty dazzled by Georgetown Cupcake’s contribution to the event! The second, unexpected, highlight of the evening was being interviewed for a short segment for C-SPAN’s BookTV. I love BookTV. I think I am the equivalent of a football enthusiast who watches any game. Any book talk draws me in, no matter what the subject. On weekend nights, I will fall asleep listening to BookTV interviews. 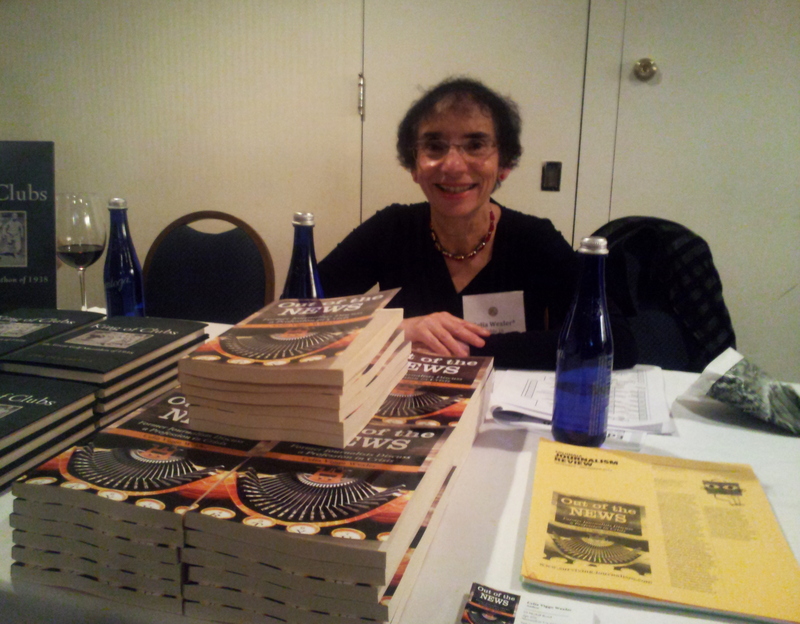 I was honored to have Out of The News featured at the 2012 National Press Club Book Fair! A post on the experience to come soon but here are some pictures for now.